In March, employees at eight Giant stores represented by Local 400 – six in the Fredericksburg, Virginia area and two in Southern Maryland – were told their stores would be put up for sale as part of the merger between Giant’s Netherlands based parent company Ahold and Belgium based grocery store Delhaize. 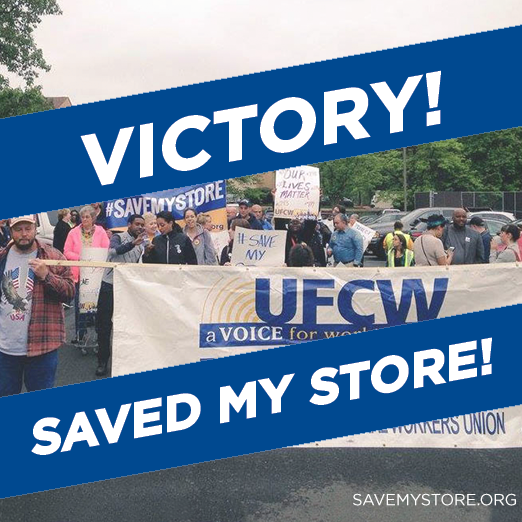 These proposed store sales threatened the better wages, benefits and grocery store experience that the Giant stores provide to the local community. Which is why Local 400 members who work at Giant, their loyal customers and community leaders banded together to help make people see that selling these stores was a bad idea. Through a series of rallies, public meetings and marches, they sent a clear message that the local community didn’t want these grocery stores and the good jobs they provide to be sold away. “I’m glad that Giant did the right thing in the end and I’m proud to be a part of a union and a community that would not give up the good jobs and grocery options Giant brings to this area,” said Robyn Wheeler, a Local 400 member who has worked at Giant in Fredericksburg City for 37 years. In addition to organizing public events that drew attention to the negative aspects of the proposal to sell the local grocery stores, Local 400 members also contacted the Federal Trade Commission and their local elected officials to express concerns about the impact on wages, benefits and competition.